December 31st, John, Stinky, Chica and I loaded into the car at about 6:30am and hit the road to explore New Mexico. Although Google Maps told us the trip was about 5 hours one way, we were confident this was an over estimate, and were leisurely about our trip. We made it home about 10:45pm. Our first stop was "the store that shall not be named" for a new choke chain for Stinky. I bought him a brand new collar over the summer, which he promptly lost with his choke chain. We've searched the back yard repeatedly, fruitlessly. I had to replace it before I could take him to parts unknown. Sadly, and much to John's frustraton, this is the only store open at this hour with the item I needed. Next we were off Dunkin Donuts - a big treat! DD's are few and far between in NM. Stinky was just dying for a couple Old Fashions and some hazelnut coffee. We had clear skies with very brisk winds. We were greatful to return to DD's lava hot bean juice from the many "doggie stops." 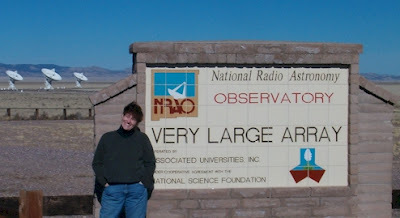 Among our stops was NRAO - better known as the Very Large Array. 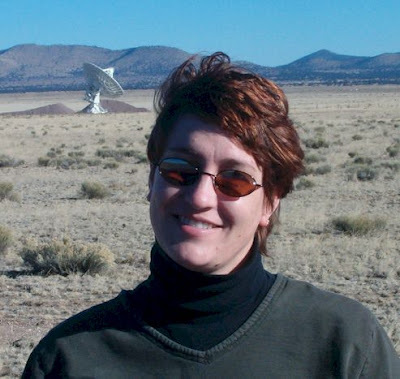 The VLA was one of those places that was "science fiction" in my mind; something I really needed to see with my own eyes before I believed it was real and not just a movie prop. The sheer size of it is astounding. John and I took time out from the road to do the mini tour in the visitor center. The fact that we were looking at science of the future, through information from the past on New Year's Eve seemed an appropriate way to usher in the new year. 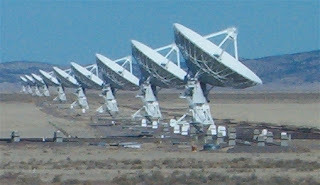 Our return trip, many hours later, had us driving back by the array under the stars. I had hoped the array would be lit in some manner so that I could see them at night. I'm delighted to report that contrary to the beautiful sight I imagined of lit antenna, we marveled at the night skies with ZERO light pollution. We were able to see the skies I remember from my childhood; constellations I haven't seen in a decade or more. This was truely a poetic highlight to an already beautiful day. Further southwest of the VLA, we visited a ghost town, Mogollon. This former gold mining town was buried deep in a little valley between high peaks. It was late afternoon by the time we arrived and temperatures had dropped significantly. The roads were narrow and snow covered, deterring us from getting out and wandering around. Perhaps we will return in the summer to explore more. The furthest point of our journey was the Mogollon Catwalk. The park featured a rocky trail leading up to a series of metal walkways over a 100 foot whitewater canyon gorge. The walkways were originally installed to maintain waterpipes for the nearby gold and silver mining. Our 3+ mile round trip walk over these suspended metal grate walkways terrified each of the dogs, but they survived and napped happily most of the trip home.